Director Harold Cronk who garnered notice with films like God’s Not Dead (2014) and God’s Not Dead 2 (2016) made God Bless the Broken Road for release in 2016 but it didn’t hit theatres until 2018. The film’s title comes from the song “Bless the Broken Road” written in 1994 by singer-songwriter Marcus Hummon with Jeff Hanna and Bobby Boyd from the Nitty Gritty Dirt Band and popularized by the country band Rascal Flatts in 2004. The song is about finally finding love after travelling through difficulties in life as God’s hand guides the way through the brokenness of the past into the happiness of the present. At one point in the film it’s heard briefly on the radio and is played over the closing credits. In many ways the song feels slapped onto the film and doesn’t play an integral part. Instead the film weaves a thematic, perhaps even parabolic, use of the “mustard seed of faith” from the Gospel of St. Matthew which better frames Cronk’s central point. 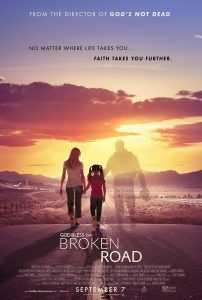 God Bless the Broken Road details the life of a widow, Amber Hill (Lindsay Pulsipher), mourning the death of her husband and struggling to keep afloat as a single parent of a young girl, Bree Hill (Makenzie Moss). Her husband, Darren Hill (Liam Matthews), died fighting in Afghanistan and one of her cherished possessions after his death is their house. News of his death, delivered to her by the military while at church choir practice, sent Amber into a spiritual tail spin resulting in her abandoning her involvement in her congregation. She opts to work 24/7 (including Sundays) at the local diner to make enough money to keep the house. Along the way she struggles with her faith and grief, her mother-in-law Patti Hill (Kim Delaney), her daughter Bree, and the prospects of a romantic relationship with a failed race car driver and convict, Cody Jackson (Andrew W. Walker), who, as part of his parole, heads up the congregation’s youth outreach program. In many ways this film revolves around Amber’s bitterness toward God and her desire to provide for herself and her daughter without anyone’s help. Going it alone, especially following the death of a spouse, is never a good idea for a Christian and as such Amber is actually the story’s antagonist. As her own worst enemy, she repeatedly eschews and declines every offer of help. Her refusal drives a wedge between her and everyone around her resulting in her losing the house she desperately clings to in her stubbornness and grief. In many ways this film revolves around Amber’s bitterness toward God and her desire to provide for herself and her daughter without anyone’s help. God Bless the Broken Road is an openly Christian film, and although Amber Hill is presented as the film’s protagonist, keen viewers will quickly see that she is the problem and her every action is that of an antagonist. The audience is asked to overlook this because she is a widow. Eventually her will and God’s will come head to head in a scene reminiscent of Job’s interaction with God in Job 7:20 “Why have You made me Your mark?” She feels targeted by God even though, as she puts it, “I believed in Your goodness I gave You everything,” she pleads that they as a family, “gave [God] everything, Our love, our devotion,” and she demands, “Where is my reward for my faith? What are You going to do to fix it?” She feels as though God is personally responsible for her husband’s death, the loss of her house, and her daughter’s turning against her; that He is the antagonist and she is the protagonist of her story. She airs all these grievances at the steps of the church she refuses to attend. What she doesn’t receive is a response from “the whirlwind of her life” like Job received in Job 38-40:2 where God asks, “Shall a faultfinder [who is not the eternal God] contend with the Almighty? He who argues with God, let him answer it.” (Job 40:2) Amber’s one-sided conversation ends in her breaking down, collapsing to her knees, admitting “Please Lord I can’t do this; I need You,” at which point her story turns the corner. Essentially the film is a battle of wills between God and the broken-hearted widow Amber. She gets what she wants; in a fashion everything is fixed. What the film avoids is the possibility that such repair may not happen in this life and some painful events leave scares and grief lasting a lifetime. Christian viewers will want to remember that accounts from Scripture like the one found in the book of Job are descriptive not prescriptive, and the prayer of faith is not transactional in the way it’s portrayed in this film. In fact, a better model of prayer is provided in the Lord’s Prayer given by Jesus where Christians are taught to pray to their heavenly Father, “Your will be done on earth as in heaven.” Such a prayer trusts that God’s will is good and gracious and “is done without our prayer” as the Small Catechism explains. The film hints at this but would better portray its truth without the cajoling “if” of the preacher and Amber’s melodramatic episode in front of the church. Placing her emotional tirade in the first 20 minutes of the film would work better. Like a romance or rom-com it appears precisely 25 minutes before the end of the film after which everything is resolved. Had the moment come at the beginning of the film it would better illustrate that God’s good and gracious will is done often despite a person’s bitterness or impatient demands, that the nature of the love that calls to people in their suffering doesn’t snap to attention based on their perceived needs. The potential for an engaging and honest film about Christian suffering, grief, and loss is buried like a seed in the film but it’s never really given what it needs to germinate and grow. The potential for an engaging and honest film about Christian suffering, grief, and loss is buried like a seed in the film but it’s never really given what it needs to germinate and grow. Instead of emphasizing Amber’s individual will faithlessness over and against the will and faithfulness of God, a more powerful film would provide thoughtful refection revealing how God had been actively at work, even in mundane things, to break and defeat everything that was set against Amber including her own stubbornness; a film where it was clearer that it was God, not her own actions or prayers, strengthening and keeping her firm in His Word and in the faith and growing the “mustard seed” of faith. As it stands the viewer for whom things are going poorly in life may surmise from the film that they have no faith or that their faith is somehow insufficient. The narrative of Amber’s dormant faith, that in the end turns out to be just big enough for God to hear it, while well intentioned as an encouragement to others may create the opposite effect inviting struggling viewers to compare their faith with the faith of others instead of just trusting that they have the gift which has been given to them by God. The film, while better than God’s Not Dead (2014) and God’s Not Dead 2 (2016), still suffers from melodramatic Hallmark Hall of Fame-style acting, writing and direction. There is a market for this style of filmmaking and some will enjoy it for its light simple approach and its lack of edginess. The subject matter however demands a more serious approach. For audiences looking for something more raw and realistic dealing with death, grief, and loss a film like Manchester by the Sea (2016) may better serve their needs. A less crass and possibly more powerful film on the topic is Shadowlands (1993) the C.S. Lewis biopic starring Anthony Hopkins as the author of the “Chronicles of Narnia” books and his short-lived romance and marriage to the American Joy Gresham and their family’s subsequent grief following her death from cancer. God Bless the Broken Road has not generated the kind of financial success or general buzz previous Cronk films have enjoyed and it didn’t do nearly as well at the theatres as recent films like I Can Only Imagine (2018) which also hinged on the targeted audience’s familiarity with a song popular within some Christian circles. By now people eager to see God Bless the Broken Road will have watched it and for those who stumble across it along the way expecting something profound and inspiring it may be disappointing or at least frustrating. Hope springs eternal that one day Cronk will provide a theologically solid film that captures the hearts and minds of Christian and non-Christian viewers alike, a film that by the will of God reaches people with the Gospel of Christ Jesus. Rev. Ted Giese is lead pastor of Mount Olive Lutheran Church, Regina, Saskatchewan, Canada; a contributor to The Canadian Lutheran, Reporter; and movie reviewer for the “Issues, Etc.” radio program. Follow Pastor Giese on Twitter @RevTedGiese.